If the govt makes up their mind, the vocal locals will be ignored. Even when they complain about something that is bad for the community, when does the govt listen ? But I do wish the Heatherbrae bypass gets priority........the end of the M1 is a nightmare every friday arvo !! And they think traffic lights on a major freeway is going to fix it ?? Dreaming !! I am amazed they have left the M1 as they have. I would have thought connecting the M1 to the A1 and have a decent interchange between the M1, A1, and the New England. It should have priority. Al, Grafton bridge is a similar construction to the old Bendy Bridge.. No bend but similar river clearance as there is no height requirement. Grafton is like Sydney, places I'd rather not go to. The Bridge will be a major improvement for Grafton, will be able to get in and out a lot quicker without these types of idiots. There's a lot of "smart" people in govt think otherwise. We can send billions overseas, but can't upgrade a road ?? This just popped up in my FB feed. Yep I was there. Was doing okay until from the floor they want the Western Deviation. Some want it starting from as far south as Valla, others from Mailmans Track interchange at the top of the hill from Repton, the start of the Bonville Upgrade, others anywhere from there through to the roundabout at Englands Road the start of Coffs Harbour basiically to go west any where as far out to connect to Coramba, then returning back to the new Highway north of Woolgoolga maybe somewhere between Halfway Creek or just make the Orara Way the new A1 highway. I have no idea at all how any of that will help with Coffs own traffic problems but it gets the Proposed Bypass away from 'their back door'. My paint skills are not that good but the Western Deviation anywhere in the yellow and the new Highway when completed will be closer to the red. The govt will listen.......and then go away and do whatever they had planned in the 1st place. The community discussions are just a feel good thing.....they listen and ignore !! Centenary drive everytime for me when heading north or south. Just to show how special our Council is they go and do this. "Coffs Harbour City Councillors have voted to support a motion that rejects major cuttings in the Coffs Harbour Bypass project, and spends ratepayer funds to tell the wider NSW community. The motion put forward by Councillor Keith Rhoades said that council support the NSW Government's proposed corridor, but reject the concept of major cuttings in preference to tunnels. While speaking on the matter, Councillor Rhoades claims that noise from the cuttings will echo right across Coffs Harbour. 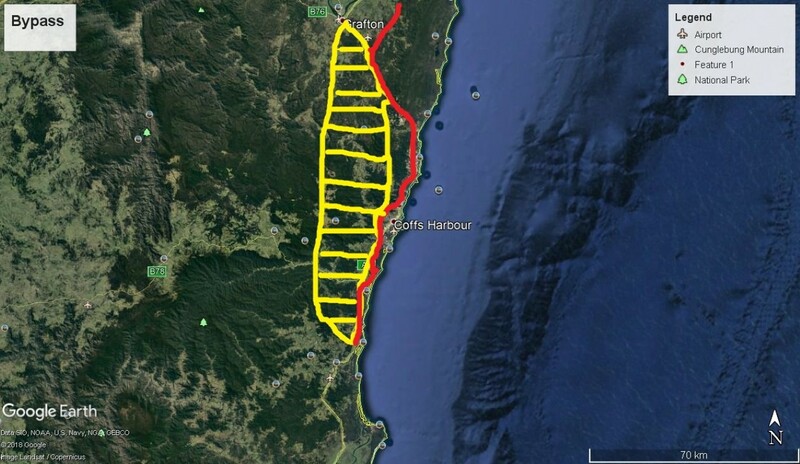 "The echoing effect will come down through Coffs Harbour and Park Beach", Cr Rhoades said. The motion will also see a campaign instigated by Coffs Harbour City Council to rally support from the wider NSW community about the affects that Council believe this design will have." They waffle with more in the article with excuses just as lame. One of their issues as a Council in a tourist location is the eyesore the Bypass will have on the natural setting of the back drop of Coffs Harbour will stop tourists coming to Coffs Harbour. As I was born in Coffs Harbour some 50 odd years ago I have already seen a lot of things done to Coffs that would be described as being more negative to the town then positive for the town. A Bypass is not one of them. 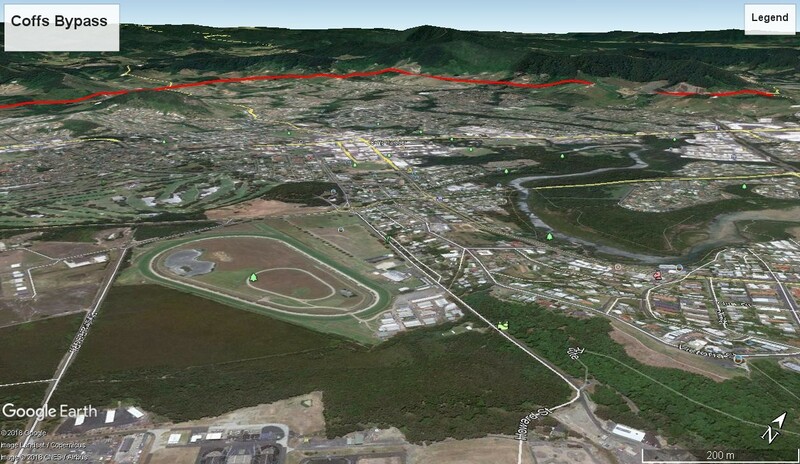 To give some idea of where the Bypass will go I had a little play on Google Earth as the part of the Bypass that goes around Coffs is already marked there. I have marked the Bypass in read and it is only an overlay on the existing contours, not showing cutting/tunnels or embankments where the road is built up but it gives an idea of the 'scarring' to the back drop, which no one will see in a couple of years anyhow. So would a Bypass stop you from visiting Coffs Harbour? I hope RMS or whoever is responsible for for the planning come back with an alternative of going straight through the town, I think they might then go, maybe then they might think the cuttings aren't to bad of an option. At least with cuttings, the dangerous loads don't get forced through Coffs Harbour CBD along the existing route. Placarded dangerous loads aren't allowed in tunnels here in Vic.. I'd imagine the same applies across Australia. and 2009 Canning Tvan pushing. Tunnels won't happen. A govt department will choose the most cost effective route ( cheapest ). They make out they listen, but behind closed doors will make their own decisions. The council can put a motion forward all they like.....they don't have a say in where the road goes ....they only think they do !! If they don't want the road....get the 900 million diverted to Heatherbrae bypass....we DO need it !! Was talking to the blokes from NSW State Planning at the last Community Meeting with the RMS display of the Bypass Preferred Design Plan. Was interesting talking to them. There are still people pushing for the Bypass to be re routed to the Western Deviation which goes too far west and misses everything. The Planning guys said as the route is already set, they will not be looking at anything other then the current Bypass route, which was reassuring. They also reassured me that the Coffs Bypass will be built this time around, once the Design Plan is settled on by as best in can by all parties. They further reassured me the project will not go the Heatherbrae to Black Hill Bypass. we got talking about the Heatherbrae/Blak Hill section and they said it is just a complete Engineering Nightmare with the amount of fixed restrictions place upon the planning. Some of which included the Indigenous sites, Wetlands, power lines, the airport and RAAF base being the main ones. They were saying the eventual section of Highway will be more like a rollercoaster ride then a section of Highway. Good luck with that. The airport/RAAF base is no where near the bypass, but yep, the wetland "bridge" will be super expensive. That's what I thought too but apparently it does affect the height of things. Which in turn causes the issue with power lines. Apparently there are some major power lines in the way. Any where else the power company will raise the lines to allow clearance for the new Highway. Due to the Airport/RAAF base, can't do that. So power lines stay at whatever height they are and the road will have to dip under them, hence the roller coaster. Those powerlines probably feed the nearby aluminium smelter which draws (or used to at least) around 10% of all the power in NSW. I am surprise the airport is an issue though. By the time the bypass gets done, the smelter will have probably closed down....problem solved. Maybe that's what they are waiting for . They way the Planning Guys were talking it is going to be a while, which as a major link in the road and the connection with the New England is amazing it has been left so long. Yeh, the busiest part of the M1 between Sydney and the Qld border and they leave it till last.....typical forward thinking by bureaucrats. Their idea of planning ahead is to start planning when a road becomes clogged.....so when it finally gets upgraded it's almost time to start planning again !! That's about it. With the Council doing their Political Grandstanding the local Radio Station interviewed both Melinda Pavey State Minter for Road and Luke Hartsyker our Federal MP. They were both asked similar questions about the Bypass and what may happen and both said the Princes Highway on the South Coast is screaming for upgrades. So if Coffs stuffs up and spills the ball, who knows what might happen. I have trouble understanding why the road between Brisbane and Sydney is referred to as number 1, 1 should mean the best but this aint it by far. When the new Ballina Woolgoolga rd is done, I hope they fix the existing road for the sake of the locals and the 10,000 Pearson trucks that will still need to use it. Once the Highway upgrades have been completed (if) then it should be No. 1, at least by Australian standards, still lacks a lot compared to other countries, especially when a recent study came back and said the Highway was unsafe to raise the speed limit to 120km/h, I think it was. As for the existing Highway, where it is bypassed it will become just another local road and handed over to Councils to maintain. The Councils get a one of lump sum to go towards the road but that is about it. I guess you look at it two ways, the new Highway to get from A to B and the old highway to go from A to Z at your leisure without all the Highway traffic. Some people have dreams, i have plans. Common sense died cause OH&S killed it. Gday Dave, hope all is well with you guys. The existing highway will be left in the current state & will be forced onto local councils to have to maintain.Yep, you and i will be paying to fix them in our local government rates.correct me if im wrong. Page created in 0.959 seconds with 27 queries.